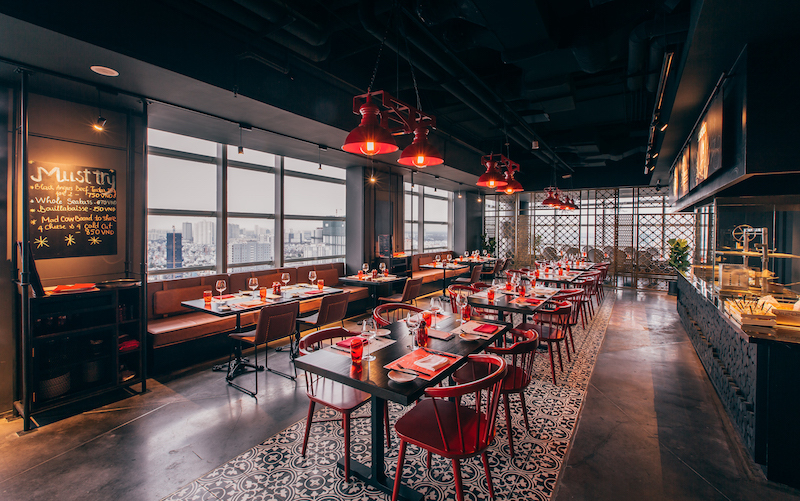 MAD COW WINE & GRILL sits on the 30th floor of Pullman Saigon Centre (148 Tran Hung Dao, D1), and the mood is set the moment you enter the restaurant: warm lighting, edgy urban decor, exquisite panoramic floor to ceiling windows and attentive, friendly staff who speak flawless English. The concept behind Mad Cow is simple—quality food and affordable wine in a relaxed atmosphere—and they’ve nailed it, it is so much more than just a hotel restaurant. Ordering from the A La carte menu (they also had a lamb special and a tapas menu, both of which we will be going back to try) we opened with the Bouillabaisse (VND250,000), a provençal seafood soup with mussels, prawn, clam, seabass and squid. The seafood was piled high into a bowl and the broth poured over it at the table. 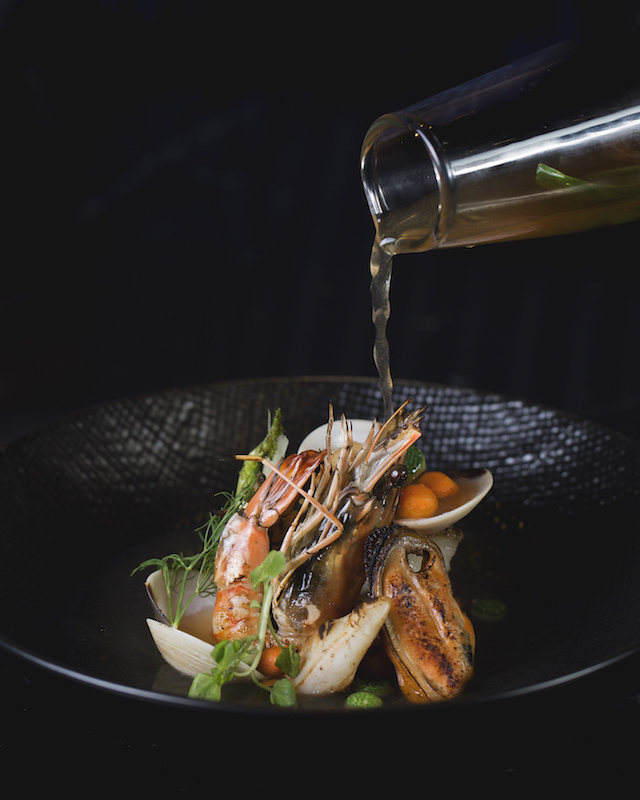 Each element was cooked to perfection and the depth of flavor in the broth took us to the ocean, an ideal starter for the night. 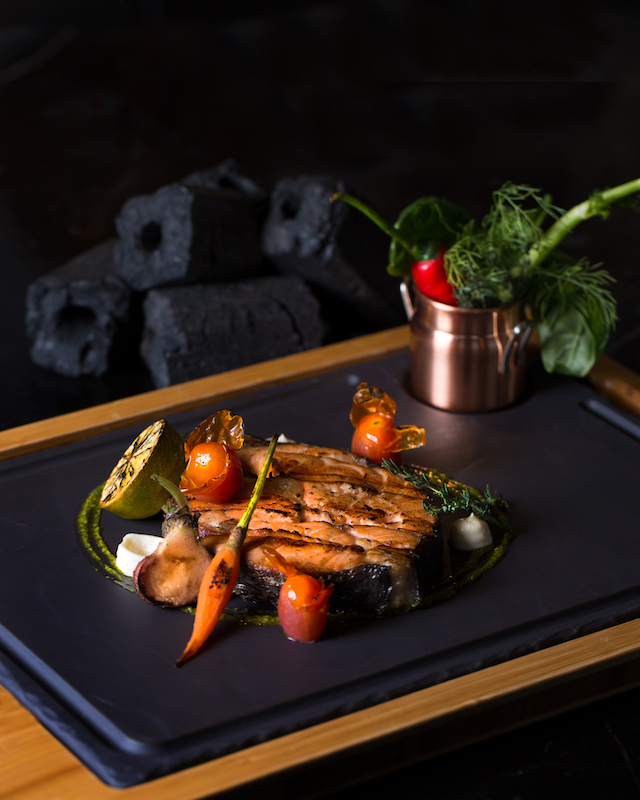 The surf course was a melt-in-your-mouth Salmon steak (VND640,000) drizzled with pesto and served with garlic aioli and charred leeks. The salmon was rich and oily, nicely grilled on the outside, pink on the inside with a slight smoky flavor from the charred leeks. This was divine. 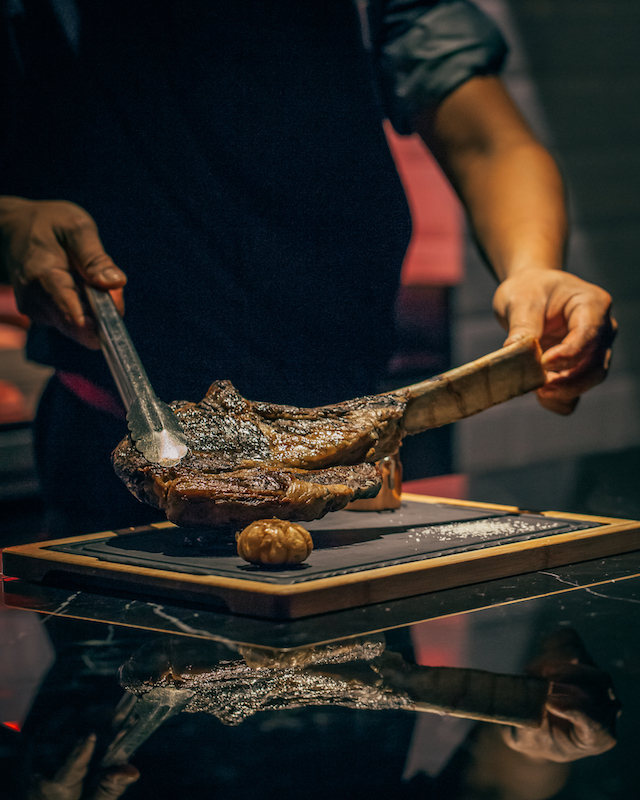 For our turf, we ordered the Tomahawk 1kg grassfed steak from the Mad Sharing category (including a choice of three sauces and two sides; VND2,4500,00) cooked rare. It’s one of their most popular dishes and although it’s labeled suitable “for two people,” this steak could feed a small family. The humongous steak arrived with beautiful char-grill marks on the outside and, as requested, rare. For a bit of live-action dinner theater, it was carved at the table for us. We chose a hearty peppercorn, an airy truffle, and a rich and zesty blue cheese sauce to accompany the steak, all three were rich with flavors that elevated the steak to another level. The sides of mashed potato with bacon (who can resist bacon on top of anything?) and the spinach with mushroom and almonds were both well seasoned and complemented the steak. There was also a wide selection of mustards that came with the meal, as well as a whole roasted garlic, which when squeezed over the steak was a sauce in itself. Despite our sizable feast, we wisely saved room for dessert. We opted to share one and settled on the Chocolate fondant (VND140,000), as there had been rumours of a free flow chocolate, macaron and cookie box floating around. Visually, the dessert was gorgeous. 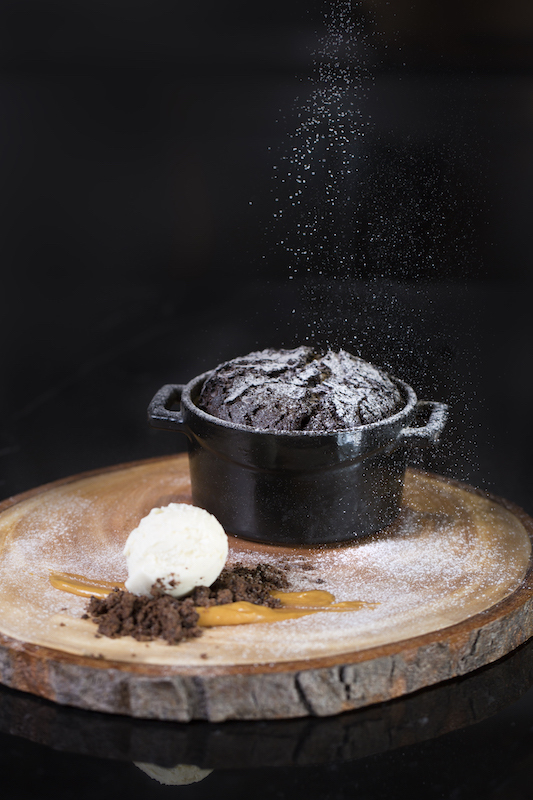 A pot of decadent warm, gooey chocolate that was essentially indulgence in a bowl. With a side of creamy vanilla ice cream set upon a biscuit crumb and a buttery caramel sauce, I slipped into dessert heaven. Mad Cow boasts the city’s most accessibly priced wine collection, with 50 different handpicked wines to choose from, and with such a wide selection on offer we asked our waiter, Diep, for recommendations. We started off with a bold Australian Shiraz and then continued to sample a fantastic Argentinian Malbec, a Cabernet Sauvignon with hints of vanilla and rounded off the night with a glass of Yalumba antique tawny dessert wine. All the wines that we tried (and many more) are available at Mad prices by the glass (starting at VND85,000). The service here is outstanding, turning a great meal into an extraordinary experience. The charming manager, Victoria, was involved in the concept-design and set-up of the restaurant, and her team has done a superb job. Every detail, from lighting and furniture to the menu (created together by Australian chef Danny Grimshaw) has been carefully considered. While only opened for six weeks there is already talk of expansion. Cheers to Mad Cow spreading its madness across Southeast Asia!